For both seasoned veterans and new players alike, The SOM is your go-to guide for definitions and techniques of sniper teams, explanations for all factors that challenge precise and accurate long-range shooting, and a collection of useful specs and tactical knowledge related to the sniper’s craft. 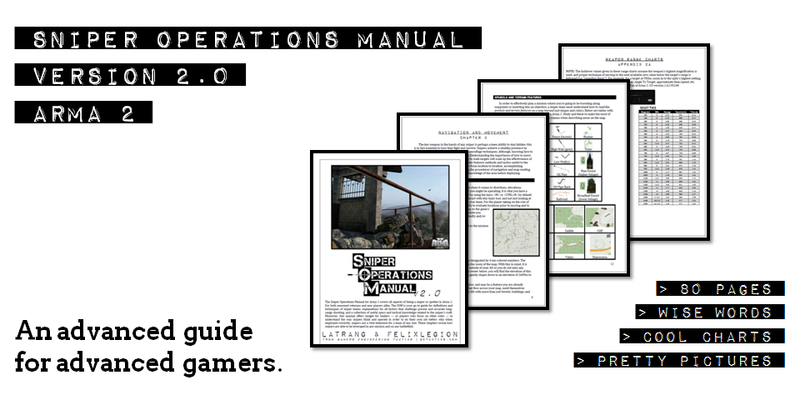 Moreover, this manual offers insight for leaders — or players who focus on other roles — to understand the way snipers think and operate in order to do their own job better; why when employed correctly, snipers are a vital extension for a team of any size. These chapters reveal how snipers can be leveraged in any mission and on any battlefield. What makes a good sniper? A good sniper must be a team player, period. It’s a defeatist approach for you to — in light of your team’s objective — not be a team player. Yes, this may mean that a long-range rifle is not necessary or even wanted. What is more, not every player can play a “sniper” too; this also could lead to a self-prescribed defeat and mission failure. All too often in gaming there is a preconceived notion that a sniper is simply a lone wolf out there just getting kills selfishly. To those players we do not respectfully award the title of a sniper. We would say that their playing is not complimentary to their team or they are in the wrong game mode …besides, if it did work with such success, everyone would surely gravitate to being a sniper. But, you’ll find that the very nature of any battle prohibits this from being worth it even in a Team Deathmatch (TDM) game mode. Maybe you’ve even experienced this while on either the losing or (hopefully) winning side. How can a sniper cover so many other snipers! Even the pawns in chess become formidable walls, making it difficult for your opponent to maneuver. The sole purpose of a sniper is to be an asset to his team by providing fluid battlefield intelligence and threatening the opposition through the application of surgical precision fire in the right place and at the right time. Due to the variety of missions a sniper can be called upon to perform, they absolutely must be able to improvise, adapt, and overcome. This is because in the same regard as any special operations unit, a sniper’s job quite often requires a heightened level of dependency, which falls only on him. They must be able to improvise to maintain the advantage, adapt to the dynamics of a battlefield, and overcome the adversities that threaten their effectiveness. A sniper continually assesses their situation during combat and reviews their performance after deployment, using that knowledge to hone their skills and abilities. He is fully aware that the variables against him are unrelenting and always trying to become unpredictable. True ghosts of the battlefield, snipers are neither seen nor heard until the precise time they choose to make themselves known.